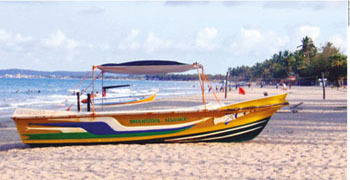 Trincomalee is a land of white sandy beaches and fishing communities, and home to a culture that is unique to the region. But it was also a strategic base during the civil conflict, and a natural port that is now drawing the attention of local and international players, as well as an economic corridor in the making. This port city’s strategic importance has influenced its history with great European powers including the Portuguese, Dutch, French and British competing for control of the harbour in eras gone by. It boasts the second largest natural harbour in the world and is overlooked by terraced highlands. Its entrance is guarded by two headlands, and there’s a carriage road along the northern and eastern edges of the city. While Trincomalee’s location – in an underdeveloped and thinly populated part of the island – has in the past been cited for its hampered development, plans are now apparently underway to develop the harbour as a commercial seaport. REGIONAL EFFORTS In July last year, it was reported that the Asian Development Bank (ADB) was considering the possibility of establishing an ‘economic corridor’ between the island’s commercial capital and east coast city. “We need to ensure the transport corridor becomes a trade corridor – and finally becomes an economic corridor,” he added. The ADB study was reportedly aimed at developing industrial clusters and the necessary infrastructure including an expressway along the corridor, and supporting clusters of urban cities along the proposed corridor. KOREAN CONNECTION The Export-Import Bank of Korea (Korea Eximbank) signed an aide-mémoire with the Government of Sri Lanka and ADB on 26 April, officially launching the Joint Consulting of the ADB and Knowledge Sharing Program (KSP) of the Government of the Republic of Korea in drawing a blueprint for the Colombo-Trincomalee Economic Corridor (CTEC) in support of Sri Lanka’s government. A signing ceremony was held during a consultation workshop for the CTEC where findings from the interim report of the CTEC Comprehensive Development Plan were presented by the ADB. The study highlighted strong high-level commitment to economic corridor development strategy at all levels of the government and engagement of the private sector as being important aspects in moving the CTEC forward. The CTEC development plan is a long-term and holistic policy instrument that seeks to provide an opportunity for the inclusive and sustainable development of the country. It includes value added inputs in the four areas of urbanisation strategies and creation of small cities, trade facilitation at international gateways, investment promotion and investor outreach activities. The promotion of entrepreneurship and innovative industries, as well as enhancing the competitiveness of SMEs as recommended by the economic corridor experts mobilised by Korea Eximbank, are also covered in the plan. The Korea Eximbank-ADB collaboration is set to improve the implementation of the CTEC development plan by bringing best practices and the lessons learned from economic corridor development projects carried out in South Korea between 1970 and 1980. JAPANESE INTEREST More recently, Japan initiated talks with Sri Lanka and India regarding the development of the Trincomalee port. Ambassador Kenichi Suganuma referred to it as an important strategically located deep-sea port that has immense potential for development. The ambassador revealed that Japan had agreed to supply navigation buoys with electronically communicable devices for the facilitation of naval movements in the harbour at night, and that discussions had begun with India on how best to develop the port in the future although there are no concrete plans as yet. INDIAN CONCERNS In 2015, Sri Lanka and India agreed to develop South Asia’s largest oil depot at a port near Trincomalee. Accordingly, the Indian Oil Corporation (OIC) was expected to work with the Ceylon Petroleum Corporation (CPC) to develop the upper tank farm in China Bay – an abandoned World War II port. India has engaged with Sri Lanka since 2003, almost 15 years after the 1987 Indo-Sri Lanka Accord bestowed first preference to India in operating the oil storage facility. According to the 2003 agreement signed by the two neighbouring nations, India was expected to upgrade and commission the 99 tanks in the farm (each with a capacity of 12,250 kilolitres) on a 35-year lease. But the project was not set in motion as intended given that the two parties could not reach a consensus on operational aspects.